Written by Damian Baalmann, M.D. Reviewed by Fernanda Bellolio, M.D. A 33 year-old, previously healthy male presents to your emergency department with chief complaint of a skin lesion on his left forearm. The patient is roomed, vitals recorded and you note he is normotensive, not tachycardic, afebrile and satting well on room air. The patient tells you that he has noticed this growing lesion on his left forearm for the past 3 days. Initially the lesion started as a “red dot” on his left forearm and now has become “blistery” and grown to about 2-cm in diameter. At first, the lesion was painless but once the “blisters” started, the pain became worse but has been fairly well controlled with extra-strength Tylenol. Otherwise no systemic symptoms and specifically no fever, chills, malaise. Exam reveals with a healthy appearing male with a 2-cm lesion with central and surrounding vesiculation on the dorsum of his left mid-forearm. There is minimal erythema and some pain to palpation of the lesion. Remainder of the exam is normal. You are just about to leave the room, considering your differential diagnosis, when, much to your surprise (and disdain), the patient whips out a mason jar with what else, but a brown spider in it! “Doc, I think this is the cause of my pain. You see, three days ago, I was putting on my flannel shirt that had been sitting on the floor of my bedroom. I thought I felt something in it as I was putting it on and then I saw this little guy crawling on the floor….like he just fell out of the shirt….I got some gloves and put him in this jar ‘cause I heard that brown ones can cause trouble.” You take the jar and note a motionless spider that is about 1-cm in length, brown, with some sort of pattern on the top of its back. You look at the patient, look at the jar, and then look back at the patient and think….what next? They are a defensive creature who typically only bites as a last resort (for example getting stuck in clothing or in shoes). This means bites almost always occur on upper arms, thorax, inner thighs. To further explain the defensive, mild nature of brown recluse, take this example: A woman who lived in an 1850s-built home collected 2,055 brown recluse spiders over 6 months from her home in Lenexa, KS. Her family of four had lived there for 8 years and no one had been bitten as far as the family knew. So do not let the presence of a brown spider alarm you and be especially critical of suspected brown spiders found in non-endemic areas. They are classically identified by a violin pattern on the anterior cephalothorax (see above), however, a more accurate way to identify a brown recluse is by looking at the eyes. 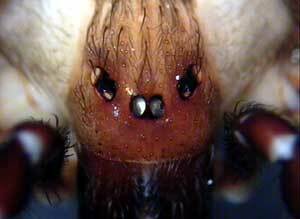 Most spiders have eight eyes in two rows of four, but the brown recluse have six eyes with a front pair and two lateral pairs (gross!) (see below). In a minority of cases, vesiculation and necrosis can occur. Typically no bigger than 2-cm but in very rare cases as large as 40-cm in a gravitational type pattern. These areas typically then heal by secondary intent without scarring, although very large areas may need skin grafting. Systemic manifestations are even rarer, but can occasionally manifest in children with fever, myalgias, malaise. And even rarer is acute hemolytic anemia, DIC, renal failure, death. Systemic conditions are more common in children and can occur in up to 16% of pediatric cases. . Therefore, pediatric patients with known bites and systemic systems may warrant more investigation such as blood work and urine testing for hematuria, coagulation abnormalities as well as closer observation. Differential Diagnosis: It is always important to keep a broad mind about what is going on in a patient. Unless history and physical is spot-on for a brown recluse bite, you should consider other manifestations of similar skin presentations including skin infections, vascular disease, systemic reactions, pyoderma gangrenosum. Your suspicion for brown recluse spider bite is high and your suspicion for infectious or other etiology is low. Unfortunately you do not have an epidemiologist in house, but you decide to treat this as a brown recluse spider bite anyway. The wound is cleaned; the patient’s tetanus is updated. You discuss with the patient the option of dapsone, but after hearing the risks and benefits, the patient states he wants to observe the lesion without meds. You think this is reasonable. He reports back in 1 week to his primary care provider where the vesicles have ulcerated minimally and the lesion is still about 2-cm in size. In 1 month, the lesion is healing quite nicely with secondary intention. Schneir, A.B., Chapter 205. Bites and Stings, in Tintinalli's Emergency Medicine: A Comprehensive Study Guide, 7e, J.E. Tintinalli, et al., Editors. 2011, The McGraw-Hill Companies: New York, NY. 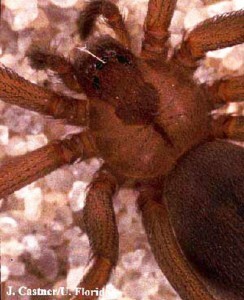 spiders.ucs.edu, Range of Recluse (genus Loxosceles) Spiders in the United States. Vetter, R.S. and D.K. Barger, An infestation of 2,055 brown recluse spiders (Araneae: Sicariidae) and no envenomations in a Kansas home: implications for bite diagnoses in nonendemic areas. Journal of medical entomology, 2002. 39(6): p. 948-51. Vetter, R.S. How to Identify and Misidentify a Brown Recluse Spider. UCR Entomology 2005 January 2005 October 6th, 2014]; Available from: http://spiders.ucr.edu/recluseid.html. Swanson, D.L. and R.S. Vetter, Loxoscelism. Clinics in dermatology, 2006. 24(3): p. 213-21. McDade, J., B. Aygun, and R.E. 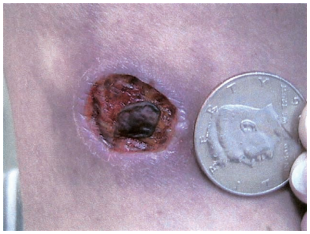 Ware, Brown recluse spider (Loxosceles reclusa) envenomation leading to acute hemolytic anemia in six adolescents. The Journal of pediatrics, 2010. 156(1): p. 155-7. Van Den Berg, C.W., et al., Loxosceles spider venom induces metalloproteinase mediated cleavage of MCP/CD46 and MHCI and induces protection against C-mediated lysis. Immunology, 2002. 107(1): p. 102-10.